Dear The Liberals, I know this is about elections, not #NSFilmJobs. My name is Ryan Campbell. I'm a young (28) professional, my field is software development, and I'm a proud Nova Scotian and will remain so until the end of my days. I'm writing you a letter—an open letter, which I freely admit is written with the intent of embarrassing you, publicly, as much as my limited ability allows. Now, I readily acknowledge this province's serious fiscal straits, and the need to address them through major fiscal realignment. I understand that previous generations have irresponsibly racked up 15 billion dollars in debt. I understand you have difficult decisions to make—decisions that shouldn't be political in nature. Decisions that should be made with the future of the province in mind. And you blew it. Intentionally. See, your decisions may give the appearance of being benevolent, cutting spending now so that we can thrive in the future. However, you and I both know what was really in mind when you made these cuts—the next election. Let me elaborate. See, while we young people may make the most noise and have the most energy to spend fighting your destructive policies, you've long since realized the truth about politics in our province—young voters have largely been driven away to seek a better future, and the two groups that make up the vast majority of voters in the province, baby boomers and seniors, are the demographics that really win elections. You're all very smart people, you're definitely aware of this simple demographic fact. The difference between you and I is that you have the power to affect change, and instead you've decided to cynically exploit a situation for political gain, and in doing so you've abdicated your responsibility to our province. Your cuts have conspicuously avoided two major demographics (baby boomers and the elderly, oddly enough) and conspicuously targeted one group in particular—young people. First went the graduate tax credit (a decision made immediately after the election, one that you didn't even bother campaigning on for some reason), "replacing it" with the elimination of interest on Nova Scotia student loans. I'll bet that one tested great with the baby boomer focus groups you tried it out on! Great politics, you guys are clearly very smart. But again, you and I both know the truth here—provincial student loans only make up a small part of the average student's total debt load. In fact, let me use my own situation as a demonstration: I ended school with over $20,000 in student loan debt—of which slightly less than $3,000 was from Nova Scotia Student Loans. You've replaced a program that allowed students to pay off $2,500 in student loan debt per year and save even more in reduced interest payments, a program which quite literally allowed me to stay, work, get married and start a family in the province I love, with a program that saves most students between $2 and $10 per month in interest. Thanks. Then you went after tuition caps…but don't worry voters, it’s only for a year! Again, it’s very well thought-out, great politics, probably tested great in focus groups. But again, you and I know the truth here. When the caps come back, they won't apply to students from outside of Nova Scotia. In one fell swoop, you've managed to discourage young people who grew up here from staying and going to school, while simultaneously discouraging young people from outside the province from coming here. Intentional, long-term harm has been done, all for political gain. Finally, the film tax credit. 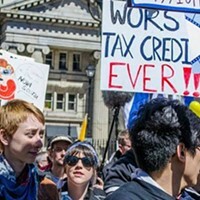 The film industry has been rapidly growing, our actors becoming major international stars, and it’s contributing many times the value of the credit in economic output (which is why premier Stephen McNeil, with a straight face, promised to extend the tax credit during the election campaign—in a strange coincidence the Liberal Party recently deleted any record of that promise from their website, but I found it here), so why would you cut this clearly successful credit? Again, you and I both know the simple answer. The film industry mainly employs young people. They're not going to win you any elections, are they? So why did you make the cuts at all, if you're actually just the cynical politicians I accuse you of being? Why try to get the deficit under control at all if you really only care about elections? Am I casting you in too harsh a light? No, no I'm not. You see, if the baby boomer generation has shown they're universally opposed to one thing, it'd be running large deficits. If you did nothing about the deficit, you'd probably lose the next election. However, they're also very opposed to additional taxes…so what were you to do? I'll tell you what you've done—you've destroyed the future of our province, and you managed to do it while avoiding any (short-term) pain for its two major voting blocs, baby boomers and seniors. 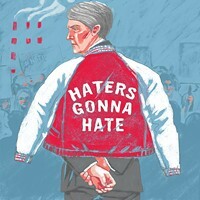 You've doomed Nova Scotia to a future of economic stagnation and decline, of further budget deficits and further debt. You've left my generation the mess, and it's not a gift we're very fond of. But hey, at least you'll win the next election—just be aware that some of us will be working very hard against you.